Daron Park, Tai Dillard and Evan Unrau will helm the Women of Troy with Michael Cooper. The coaching package for the 2012-13 USC women’s basketball program is now complete, head coach Michael Cooper has announced. The leader of the Women of Troy enters his fourth season at USC with three new coaching talents by his side, as Cooper has brought in Daron Park, Tai Dillard and Evan Unrau for the coming season. “I just think this whole group of coaches I have coming in is definitely a staff that will work well together,” Cooper said. Associate head coach Daron Park comes to USC after a season at California, with a resume replete with success in eight seasons of collegiate coaching and seven NCAA Tournament appearances. Before his stint in Berkeley, where he helped the Bears to an NCAA appearance in 2012, Parks served as associate head coach at Louisiana Tech for five seasons. Park and the Techsters made back-to-back NCAA appearances in 2010 and 2011. His collegiate career began in Maryland, where he and the Terps won a preseason WNIT championship and earned two No. 1 seeds with two trips to the NCAA Elite Eight. Park had come to Maryland after serving as an assistant coach at Utah from 2004-07, where he began to gather his NCAA Tournament prowess in reaching two tournaments, including an Elite Eight appearance in 2006. “In going through the process of looking to revamp a coaching staff, you always want to get the best, and coach Park is a very solid coach,” Cooper said of Park. “He knows his Xs and 0s. He was at Maryland for some great NCAA runs, and he was at La Tech with Teresa Weatherspoon to build that program. With him there, they pushed into NCAA tournament play, and in his last year at Cal he helped that program get to the tournament with Lindsay Gottlieb. Assistant coach Tai Dillard comes to USC after five seasons as an assistant coach at UTSA. Prior to that, Dillard has an accomplished collegiate and pro resume as a player, having played at Texas before starring in 57 games as a guard for the WNBA’s San Antonio Silver Stars. While coaching at UTSA, Dillard helped see the Roadrunners to back-to-back NCAA Tournament trips in 2008 and 2009. A four-year letterwinner with the Longhorns, Dillard also experienced four NCAA Tournaments as a player, including a visit to the 2003 NCAA Final Four. Assistant coach Evan Unrau also brings experience as a player to the Trojan coaching staff. 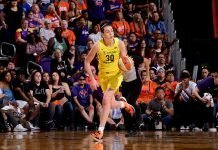 An Honorable Mention All-American during her four years playing at Missouri, she also was drafted by the WNBA’s Washington Mystics and also played professionally overseas. Her coaching career took her most recently to Santa Clara, where she was an assistant for three seasons. Prior to that, Unrau served as an assistant coach for one season at UC Santa Barbara, reaching the 2009 NCAA Tournament. Her collegiate staff experience began at Stanford, where she was video coordinator during the Cardinal’s run to the 2008 NCAA title game. Are you ready for this National Championship game?